While watching another election report I heard that one of the candidates was campaigning in Chagrin Falls, OH. What a name. A mountain of high school consumerist desires surfaced when I saw this gallery of early computer ads. Oh! The VIC-20! Be still my heart. I recall that the $99 Timex was available for checkout from my local library. Courtesy boing-boing. Watch the video and then read on for the punch line. No, it’s not the cheesy line about tricking the intern. Fox blew it with the image of Douglas. The series of debates were between Lincoln and who were opponents in the 1858 senate race. Stephen Douglas favored a nation comprised of both free and slave states. Lincoln did not see this as a viable option. Fox News pictured Frederick Douglas, freed slave, abolitionist and author. Not the same Douglas. If it were April Fool’s Day I’d figure that someone clever was at work. But this seems legit. Joan Kennedy Biddle of Tampa, FL knows her family history. And part of that history is a $299 promissory note given to her ancestor 1861 by the city of Tampa. Tampa needed ammunition and other supplies and paid with an IOU instead. The 2008 city of Tampa points out that the 14th Amendment eliminated lingering Civil War debt. Plus, the note may have been in full in the intervening 147 years. It’s always good to know your ancestry. The Memphis Belle: A Story of a Flying Fortress– the original 1944 documentary directed by William Wyler. The 1990 Hollywood film was made by his daughter, Catherine Wyler. Centennial of Flight – the role of bombers in World War II. Here’s a follow-up to last week’s discussion of Japanese soldiers who continued to fight or hide long after World War II had ended. The stories are varied and fascinating. In some cases, these soldiers were aware that the war had ended and were forgotten in the tumult of the years following surrender. Others continued to actively fight in a war that they thought was still raging just over the horizon. No Surrender Japanese Holdouts (http://www.wanpela.com/holdouts/index.html). Be sure to checkout the registry section. 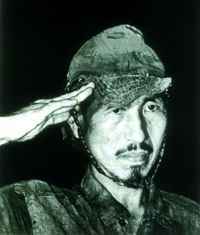 Hiroo Onoda surrendered in 1974 and expressed shock and disbelief when officially informed that the war was over. His book, No Surrender: My Thirty-Year War, chronicles his story of a long and solitary fight. AT&T announced today that it will end payphone service in 2008. Increasing use of cell phones has reduced the profit in the payphone. First the loss of the phone booth and now this. Tragic. What will Superman do? Actually, all is not lost. You can buy your own Superman booth right here. Or buy your own payphone and start making money. Your children will find the concept of a payphone bizarre. Better use one now for old times sake. Paul Tibbets, who piloted the Enola Gay on her mission to drop the atomic bomb on Hiroshima, died last week at the age of 92. I found this 8 minute interview with Mr. Tibbets on YouTube. The clip is from the documentary “Atomic Cafe” which was released in 1982 when the Cold War was still quite hot. I’d guess the interview itself is from the mid-sixties. Take the “graphic images” warning to heart. There are images of Hiroshima wounded mixed in with the interview.